Back in January, I had the privilege to ask Jay from Between The Wars some questions of their upcoming release Won’t Go Quietly. If you have not read it (or want a refresher) you can find my post here. Last week, Between The Wars posted the full album on SoundCloud to give their fans a taste and encourage them to pre-order. I will tell you know, go pre-order it, you won’t be disappointed! BTW continues with their great story telling in melody, their sound is more edgy, but the feel is definitely still BTW – old fans won’t begrudge the sound change and new fans can go back to their older stuff and appreciate it. One of my favorite facets with these guys, and has been from the beginning is how the tempo and feel of the music does not always match the lyrics so if you are listening to the music in the background, just enjoying the feel and having fun, when do you pay attention to the lyrics you are blown away by the depth and feeling. To start the album out is “Worst Enemy”, it is easily identifiable as a BTW song, though the vocals are more gravely, the music is harder and gives you a great promise of what is to come and was quickly one of my top picks on the album. “My Seafaring Home” follows up with a song with quick lyrics and music that had me taping on my desk all week. “Goodnight Sweetheart” is the story of war-torn England and the blackouts. The fiddle work is exquisite and the pacing of the song fun though the subject matter is not fun. This song has really been growing on me with its depth. Speaking of depth, “First Train Out” is one of those songs that I referred to earlier, that it is on the surface an enjoyable song, then you get beyond its surface and the story of the song is incredible and melancholy. Appropriately, the next song up is “Afraid of Death” which was an early top song for me. The spirit of the song driven by the vocals and music, and again the great fiddle work make for a great tune. “Oh Penny!” is the lightest song on the album and the song is about past love moved on. The song is fast, you want to clap along with and sing out “Oh Penny!” Again this song tells a story, from the early stages of infatuation through the loss his love to someone else. “I’ll Dance On Your Grave, Mrs. Thatcher” is a political song by John McCullagh and features him on the song. I can see why BTW would want to include this song – it follows along with their MO of great storytelling put to music regarding striking miners. This is the hardest rocking songs on the album and their conveyance of the anger is fantastic. “I Won’t Ever Get Between My Woman and Her Whiskey Anymore” is more country feeling, and perhaps the greatest departure from previous BTW songs. It features some great tempo changes and once again, their new fiddle player steals the show of the song. “Rural Juror” brings the pace down to a song that has the music to match the lyrics, making it more poignant and thoughtful. “Ever Present Storm” brings the pace back up with a haunting tune of revenge with some brief guitar work reminiscent of spaghetti westerns. “A Sailor’s Lament” is a song that starts out slowly, with vocals and the sounds of water in the background before ramping up a bit, then at the 3 minute mark it ramps up again. Finishing out the album is “Frustrated From Berwick”, a song for those who chose for whatever reason of doing nothing instead of standing up for what they believe in. The song is catching not really in a fast way but through the repetition to drive home the point. For new and old Between The Wars fans, this is one for your collections. In their interview they talked about how they enjoy telling stories with their songs and this album clearly shows that (along with their past works) and the skill they are able to craft music that belies the words of the song, so you actually have to listen, is what, to me anyway, really enjoyable about BTW. You have to think to actually get some of their songs and this world needs more people to think and not be sheep. To me that is the great thing about punk – don’t be a sheep, be who you are regardless of who the sheep want you be. So I’ve got my pre-order in, do you? Back on July 3, 2011, I wrote and posted my first ever review. The review was for the Aussie band Between The Wars for their debut album Carried Away. At the time, these guys from down under put their trust in an untried Yank with only a three blog posts to his name and no history of reviews. So it is very fitting that they have placed their faith in me to do my first interview about their upcoming CD set for pre-order in February and being launched on St Pat’s day. Jay contacted me via Facebook and below is the interview questions that followed as result. 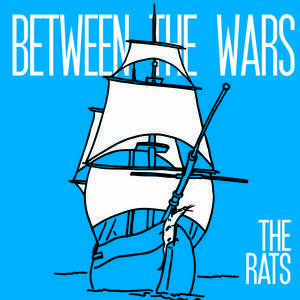 In case you have not heard of Between The Wars, they are a six piece band from Melbourne, Australia started in 2009. They are Aaron Allen – mandolin & vocals, Hayley Anderson – violin, Dan Scalpelli – drums, Jay Stevens – vocals & guitar, Jason Hatcher – vocals & ukulele, Paul Trevorrow – bass & vocals. I have reviewed their two releases, Carried Away and The Rats to help you get acquainted with this great young band from below the equator. RTC: How long have you guys been playing music? Jay: We’ve all been in different bands over the course of many, many years – i’ve been doing stuff musically since I was about 15 (so 15 years for me). Jason and I have been in a few bands together as we’ve been best friends since high school. Aaron has been a solo artist as well as working with his band The Dufranes for a long time. Hayley was in a band called Zeptepi before joining us, Paul’s been doodling around on guitar, bass and drums since he was a teenager, and Dan has been in a few bands from the outskirts of Melbourne. Basically we’ve all been in bands before which is why there is little to no politics in this band – we don’t do drama, we mesh well and make decisions together as a group. RTC: How did you all meet and how long had you known each other before deciding to form the band? Jay: Jason and I formed this band in 2009 with the help of English singer/songwriter John Mccullagh. As I said before, Jason and I have known each other since high school and have played music together for the same amount of time. Between The Wars has gone through many lineup changes over the past 3 and a half years, with the current one the most solid it’s ever been (the majority of the band have been in the lineup since the start of 2011). Paul was a fan of the band who I befriended and filled in for us on bass for a couple of shows before we asked him to join full-time. We played with Aaron’s band (the Dufranes) in 2010 a few times and we always got on well – we were looking at expanding the sound and asked him to join on mandolin in early 2011 after he played with us for a friend’s birthday. Dan joined us at the end of 2011 after we had some issues with the previous drummer – he has been one of the main reasons our sound has evolved over the past year. Hayley is our newest member, joining the band in September after leaving her previous band Zeptepi for personal reasons. We haven’t had a huge amount of luck with violinists over the years and it’s awesome to have someone in the band who’s so passionate about our music! We knew she was going to be a great fit from the moment she walked into the rehearsal room with printed musical notes for three of the songs that are on the new record. RTC: The band name comes from the Billy Bragg song “Between The Wars”, what about that song spoke to you guys that inspired you to name the band after it? Jay: The band name was my idea. Between The Wars is one of my favourite songs, and it really sets the precedent for how I wanted to move forward lyrically – telling stories like Bragg does and putting our songs and lyrics in different settings, rather than the oft-used odes to love and relationships that I was so used to previously. RTC: Who are some of your musical influences? Jay: Personally, I draw influence from traditional groups such as the Dubliners, Christy Moore and the Wolfe Tones (and pretty much anything Derek Warfield does), as well as more contemporary celtic bands such as the Pogues (and the Popes), Flogging Molly and the Dropkick Murphys. For this record, I really drew a lot of lyrical inspiration from Frank Turner, Jamie Hay, Billy Bragg, Midlake and Bruce Springsteen, and musical influence from Hoist The Colors, the Roughneck Riot and our Melbourne friends the Shadow League. The other members all come from massively different backgrounds, so I’d be loth to include their influences – but I can name a bunch of bands that we’ve discussed at various points such as Snuff, Bad Religion, Descendents, Propagandhi… and most of us love Springsteen. RTC: What drew you to Celtic music and what was your muse to put your own spin on it? Jay: I was jaded about writing pop-punk songs about unrequited love as I had for (at the stage) the past eleven years. John Mccullagh introduced me to Christy Moore and the Wolfe Tones and I was immediately inspired to start writing tales and stories. This band owes a lot to John for that one moment he asked me to learn “Ride On” by Christy Moore! RTC: How do you feel you have grown over the years playing together? Jay: If you listen to each of our records, starting with 2010’s “Carried Away” and finishing with this new record once it’s released, you’ll hear a band that originally wasn’t 100% sure of what it was doing, wasn’t 100% in its collective direction, but is now solid and excited about playing music together. We have crafted and created each of these songs meticulously, with input from every single member in the band, which is something that hadn’t really been done in the past. You’ll hear a band go from being a dictatorship to a collective democracy with everyone getting a say; this is so evident on the new record. There are the majority of songs with me singing, but there are also three songs on the record with other members doing the lead vocals (uke player Jason on “Ever Present Storm” and “Afraid of Death” and mandolinist Aaron on “I Won’t Ever Get Between My Woman And Her Whiskey Anymore”). RTC: How do you go about writing your songs? Jay: I’m a lyrics-first writer, always writing down phrases and lines. From there, if I have something lyrically good (or malleable lyrics at least), I’ll pick up the guitar and fiddle until I get a good chorus hook, something that works in a repeating context. Then I’ll move to the verses and try and put together something that fits with the chorus chords and melody. My next thing is to put those down in an iPhone voice memo or on Soundcloud and listen to it later and see if it needs changes or additions (ie main riffs, or verse introductions etc). From that, I’ll take the songs to rehearsal and see what the others think. If they like it, we begin arranging (which is my favourite part). I’m lucky to be surrounded by incredibly creative people who come from really different musical backgrounds so they being different things to the table when it comes to my songs. This takes them in directions I may never have imagined. We have a song on our new record called Oh Penny! which was written just as a slow acoustic folk song and I wasn’t 100% on it, but it’s changed almost to a celtic folk punk band version of a Springsteen song. RTC: In the pre-interview chat, you said you guys were being really conscious of setting yourselves apart from other bands you are friends with like Ramshackle Army, the Rumjacks, the Roughneck Riot and Zeptepi. How are you going about that? Jay: First of all, I say that with no disrespect to those bands at all. We love them! I guess in a “scene” with so many different celtic bands (be it celtic punk like the Ramshackle Army, the Roughneck Riot or the Rumjacks (RIP) or celtic folk like Zeptepi), it’s easy for bands to sound the same. 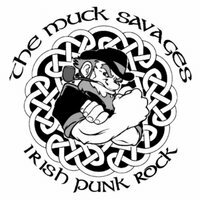 You can draw a line from a few bands that we’ve heard over the years directly to the Dropkick Murphys or the Pogues or whoever. What we really tried to do, especially on this record, is to make each and every song sound a little bit different – we didn’t want a record with 13 songs all following a similar beat or lyrical theme or whatever. I want the listener to listen to the record and be intrigued or have their interest piqued by each song’s difference. I have no interest in keeping our sound the same as what it was on 2011’s “The Rats” EP. Whilst I love that record and I’m very proud of what we did, I didn’t want to write the same old songs with the same old sound. RTC: What should your fans expect from your new release? Jay: It’s a bit different to what we’ve released before, but not so vastly different that you’ll be switched off from it. We’re constantly evolving and striving to create the best record we can make at that point in our lives. I think people will really love it! I hope so anyway. RTC: How do you feel your music has progressed over the years? And where do you see it going? Jay: As I mentioned before, we’ve progressed from being unsure of where we stand as a band, to being more surefooted in the way that we go about creating our music. As for where I see it going, I can’t tell you. “Won’t Go Quietly” contains some of the best lyrics I’ve ever written and I’m supremely proud of the whole record. We’ll see where this takes us musically and go from there! RTC: When are you opening up the pre-orders for the new album? What about international orders? Jay: Pre-orders open for “Won’t Go Quietly” on Monday 11th February, worldwide, through the Slippery Slope Recordings (our label) online store (slipperyslope.bandcamp.com). The record’s scheduled release date is St Patrick’s Day (17th March). RTC: How are you guy celebrating the release? Any release parties planned? Jay: We’ll most definitely do a Melbourne launch show and hopefully a few others around Australia (Brisbane, Sydney, and some country Vic shows). I’m heading over to England in October to play a fortnight of shows, so looking forward to that as well. RTC: How do you see the scene the Celtic Punk scene growing in Australia and what do you think some of you major hurdles are to developing a following nationally and internationally? Jay: It’s exploded over the past few years with bands like the Ramshackle Army and Paddy McHugh & the Goldminers becoming more and more popular, in addition to old favourites like the Go Set and Mutiny still maintaining a good following here and overseas (although Mutiny are restricting themselves to one or two shows per year now). We’re proud to be a part of a burgeoning scene. Major hurdles for us nationally is that it is very expensive to tour Australia, mostly you have to fly between capital cities and that can prove prohibitive for a six-piece band. Similarly for an international following, it is quite expensive for us to go overseas (although we are proud of our friends’ bands that have made the big jump overseas like the Ramshackle Army and the Go Set). Half the band has young families too which makes it really difficult to come and see you all for an extended period of time. I’m hoping that our UK tour in October (although the whole band isn’t making the trip) will help with our international following, and hopefully people from all over, with thanks to websites like yours and podcasts like the Grinning Beggar’s, get a chance to have a listen to our new record. And hopefully enjoy it! RTC: Where do you guys want to see yourselves in a year? Five years? Jay: In a year, hopefully we will be writing again, playing some good supports for international bands over here in Australia and just enjoying what we do. Five years is a long time in music, our band isn’t even four years old yet so I can’t really answer that. I just hope we continue to enjoy playing live, continue writing good songs, and basically just have fun. That’s what it’s all about, isn’t it? RTC: OK, here is a catchall – What else would you like my readers to know that I may have forgotten to ask? Jay: We hope you enjoy the new Between The Wars record “Won’t Go Quietly”, we’re proud as hell over it and really hope you get as much out of it as we put into it. Please let us know what you think on our Facebook page. Thanks heaps to Randall for doing this interview, we hugely appreciate it. Jay was kind enough to send me a rough cut of one their new songs, “Worst Enemy”, and I from what I have heard, I am eagerly waiting on the final product! The evolved Between The Wars sounds edgier but still with the great story telling lyrics that I have enjoyed from their songs. I can’t see how you can go wrong by pre-ordering their new release Won’t Go Quietly starting February 11th by cruising over to slipperyslope.bandcamp.com and then enjoy on St Pat’s day with some music! Psst…Have I got a double secret review for you! It has been longer between post than I like, I promise you it was for a good reason. This past May, the air conditioner in my fugly purple Neon went out (the car was a gift, I can’t complain! ), and I have been making do while St Louis has had its hottest summer in a very long time. Long story short, I started shopping for a car a little after my last post and it has taken all of my time. After much research and a few test drives, I found the car for me – a 2005 Mazda 6 wagon that I have dubbed The Paddy Wagon. 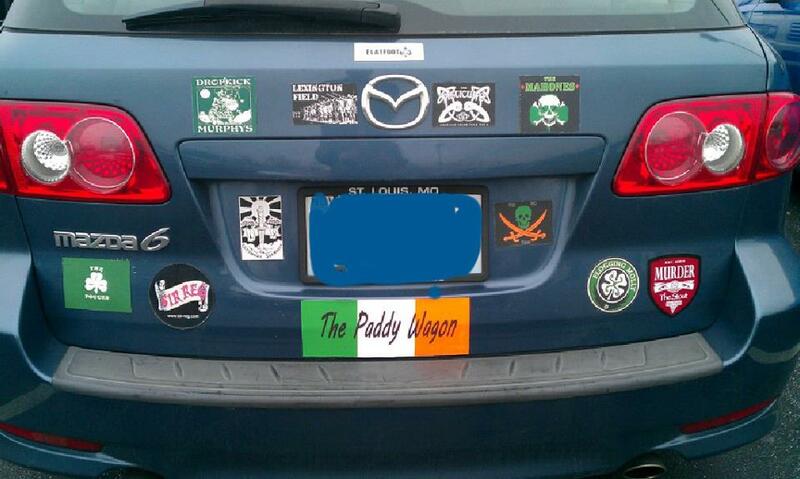 I did lose my DKM and Cutthroat Shamrock stickers, so now I have to get more. Good thing I will be going to Shamrock N Roll Fest next month! Well, enough about me, on to my review. I had this album on repeat all day Monday and this afternoon. It has been listened to while doing nothing, driving The Paddy Wagon (did I mention it has a 6 speaker Bose sound system?) and while at work. The more I listen to it, the more I enjoy it. The songs are really growing on me. At first listen, I enjoyed Lone Pine and The Tail of The Rats. The song on my first listen that did not really catch my attention was Keep To Yourself, but as I listened to the EP more and more, Keep To Yourself has become one of my favorite songs. This EP also led to learning something of Australian history in Lone Pine. The song is clearly a soldier’s lament. Being a product of the American school system, the only history other than American history that was taught was European history – even the education of World War I covered the western front and ignored the conflict in the Ottoman Empire. So today, I learned about the Battle of Lone Pine. Clearly there are some songs that probably have a deeper meaning to an Australian than to this uneducated American, but that does not take away from the pleasure of listening to this band perform. Music has become my therapy, when I leave work in a foul mood, I have two ways to get rid of it on my way home. One is to listen to power, anger filled songs and burn the anger and exhaust it, the second is to listen to light-hearted songs and let the music lift me and dissolve the anger. The Rats falls into the latter category, but the songs themselves are not light-hearted or funny – it is the beat and rhythm and the passion Between The Wars clearly has for their music. So in my opinion, break out your wallet, pre-order the EP, and enjoy! I wish I lived in Australia so I could make it to their EP launch party. If you are a lucky one, have a beer for me! Slainte! 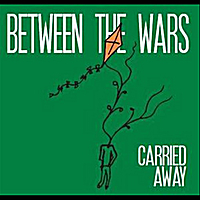 I want to send a big thank you to Jay Stevens of Between The Wars for sending me a copy of their CD Carried Away! I would be in the poor house if I had to buy all that have found to be great music. Streaming has been a great money saver, but doesn’t give me the freedom to listen to a whole CD from beginning to end. I hope to repay his kindness by spreading the word about their fun and delightful music. First, I want to give a caveat that I have no musical background, have a poor ear for pitch or tone – so if you are looking for a technical review, you won’t find it here! But I can review it on the emotional level and to me, music is more about the emotion and power. The stirring of the soul is much more important to me than the technical aspect. If I wanted technical music with no soul, I would probably be listening to top 40 dredge instead of Celtic Rock and Punk. The second caveat is that I have never a review before, so bear with me as I find the best way for me to express my thoughts. As you can see, the CD has a mix of original and well-known cover songs. I always find it interesting on how bands will work on spinning covers in a unique style, but where I find bands truly shine is in their original compositions. I appreciate a band who can create something new that infuses the same classic-style soul and themes, with the timely influence of the world today. From the gate, Between The Wars hits you with contagious rhythm, causing unconscious foot and hand tapping. The songs are melodic, relying equally on the instruments and the vocals. Ciaran – What stood out of me is the love of the father for the son, and the son of the father. While I am not able to relate to the son’s perspective, I hope to be able to be that kind of father to my sons and to encourage them to find their path in the world and for them to know my pride for them. There are some songs I had greater hopes for that did not deliver for me. I have yet to hear a version of Come Out Ye Black and Tans that is able to drive the balance of melody and hard-driving instruments that I think Celtic Rock and Punk could bring it. I want to find a version that can take the hard-driving rock and still keep the vocals, so please let me know if you know of one. The versions that rock the music tend to scream the vocals, removing some of the emotional impact of the song. Other versions tend to be more traditional, just a little rocked up. So far, my favorite version is still from the defunct Bleeding Irish. The other cover that fell a bit short of expectations was Whiskey in the Jar. The song was good, but nothing for me that was mind-blowing. Overall, I found the CD fun to listen to, with a good mix of light and deep songs that stirred my soul. Listening to the CD made me wish I lived in Melbourne, or that Between The Wars makes it big enough to have an US tour so I can see them live and buy their swag to show that I am a fan of theirs. As it is, I will settle for their CD and enjoy what I can. I look forward to any feedback on my review in general, of specifically of Between The Wars CD. I believe in free speech so feel free to disagree with me – I am just one Yank in the broad global Celtic Rock and Punk fandom.